Available in 65 inch and 75 inch displays. The latest premium TV offerings from Hisense have arrived with the 65 inch Series 8 and the 75 inch Series 9 ULED displays now available in retailers across the country. Earlier this year, Hisense used the 2017 Formula 1 Grand Prix to first unveil its new TVs in the exclusive Red Bull Racing suite at Melbourne’s Albert Park. Hisense invited a select group of media to a Sydney CBD location last week to review the latest TV offerings. 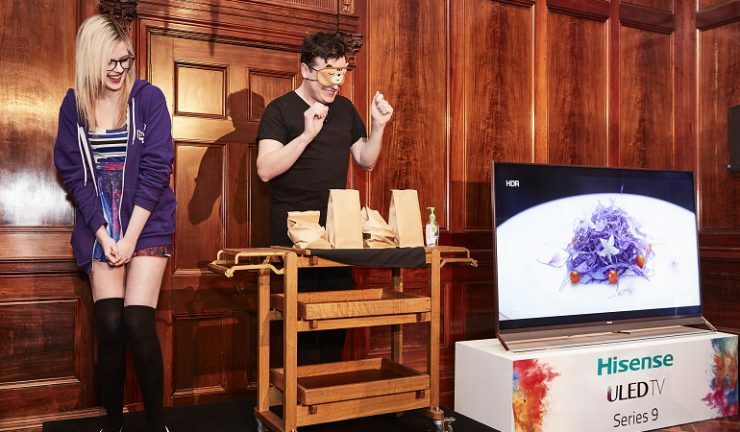 The evening was hosted by Australian magician and mentalist, Matt Tarrant to coincide with the company’s global ‘See The Incredible campaign’ which captures the immersive experience consumers have had with their Hisense 4K ULED TVs. Tarrant performed an array of magic tricks to entertain attendees (see picture below). The Hisense Series 8 (RRP $4,999) and Series 9 (RRP $9,999) ULED TVs are available at JB Hi-Fi, Harvey Norman, The Good Guys, Radio Rentals, RT Edwards and Bing Lee.